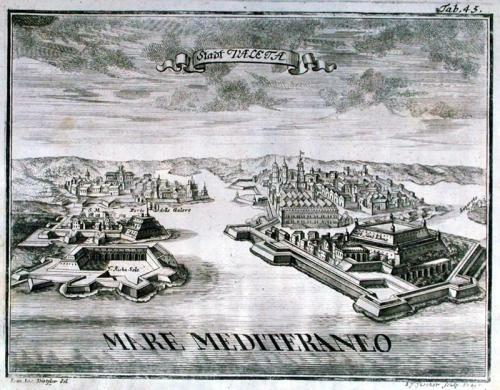 A rare engraving of Valletta, the Capital of Malta. Valletta is named after its founder, the Grand Master of the Order of St John, Jean Parisot de la Valette. But the city really owes its birth to his arch enemy, Grand Turk Suleiman the Magnificent. When the Knights arrived in Malta in 1530, they settled in the small village of Birgu, which was protected by Fort St Angelo. They managed to enlarge the old St Elmo watchtower on the Sceberras Peninsula opposite, but their defences were still weak. The strategic importance of Mount Sceberras was to become all too evident during the Great Siege. Valletta had been planned before the siege. But the plans could only be executed once a grateful Christendom had lavished riches on the Knights for their defeat of Suleiman. Pope Pius V and King Philip of Spain gave financial aid and loaned the services of an outstanding military engineer, the Italian, Francesco Laparelli. The magnificent fortress city grew on the arid rock of Mount Sceberras peninsula, which rises steeply from two deep harbours, Marsamxett and Grand Harbour. Started in 1566, Valletta was completed, with its impressive bastions, forts and cathedral, in the astonishingly short time of 15 years. From a book by A M Myller recounting his travels from 1725 to 1727. Myller journeyed from Rome to Jerusalem then on to Troy, Gallipoli and Constantinople. From Constantinople he travelled to Egypt and then to Syria. Finally from Syria he travelled to Malta and back to Rome.